LAKE CHARLES, LA (KPLC) - Chennault International Airport is getting a much needed upgrade to its main runway. Construction crews are repairing the runway, which hasn't seen major work done since 1986 when the airport reopened. The runway is 10,700 feet long, 200 feet wide and 17 inches thick, handling some of the largest aircraft's in the world. John McMullen, Chennault's Director of Maintenance construction, said they chose to give the runway a facelift to accommodate new and upcoming tenants. "The first question a prospective tenant will ask is what is the condition of your runway," McMullen said. "We're able to accommodate any size plane and when the president decides he wants to land here, they want to know the condition of the airfield." Work on the runway will include runway reconstruction, lighting improvements and a blast pad. 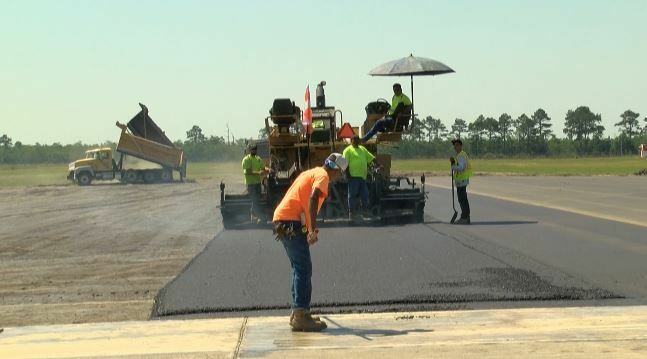 The project is expected to cost $7.2 Million, with the Federal Aviation Administration and the Louisiana Department of Transportation funding most of the work. McMullen said once the project is done in late August, it could bring a boost in the local economy, with more jobs available in aircraft maintenance. Recently, Chennault was named the "Louisiana Airport of the Year" by the Federal Aviation Administration, mainly due to developing a plan to improve the main runway without sacrificing service.